Pre-cut 10″ Superior Logs spread on subfloor. Pre-cut 10″ Superior Logsgoing up- Note metal log at floor and foundation flashes we provide. 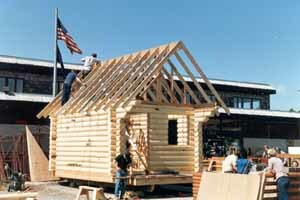 Pre-cut 8″ Superior Logs with attached frame garage that will be log-sided to match the home. 10″ pre-cut Superior Logs bolt together within hours. 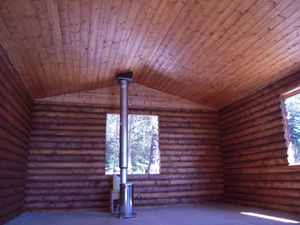 A remote 6″ log pre-cut cabin ready for the windows we supply. 8″ pre-cut Superior Logs Fire Island Visitor Center under construction using our complete shell materials. 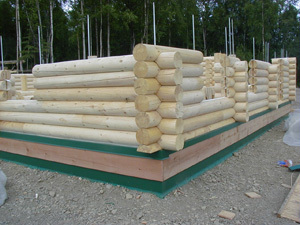 Our pre-cut Alaskan made Superior Logs are shipped in bundles weighing approx. 2,500 lb. or less. The bundles are clear poly wrapped, metal strapped with thick cardboard corners against the logs (no straps touch your logs) & “X” braced on each end. We also use wood slats (stickers) between each course to stabilize the bundles so our packages can travel great distances. We delivered the 26′ X 36′ Juneau plan subfloor to the job earlier. When the subfloor was in place the logs arrived. 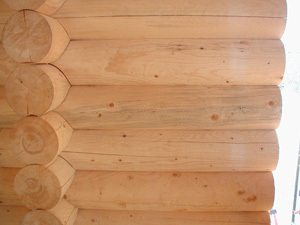 Superior Logs are usually placed on the subfloor for stacking. The logs are spread to distribute the weight. Carefully open each bundle, spread the logs & place the shorter logs on end with the numbers up for easy access. Our 5/8″ X 40″ all thread bolt system at 4′ O. C. or less in the running walls, 12″ O. C. or less at each opening & centered in each saddle corner starts at the foundation & goes through the 2 X log top plate. We provide a foundation bolt plan with each package. 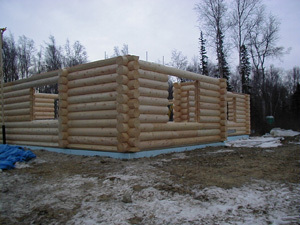 This 8″ Superior Logs pre-cut package was assembled by a 4-man conventional framing crew who had never stacked any logs before. They worked at a comfortable, safe pace & followed our pre-cut Superior Logs stacking guide & log wall layout (they are looking at the layout stapled to a piece of CDX). We provide the foundation bolt plan, detailed materials list (with shell packages), Superior Logs wall layout showing each log by number in each wall, stacking guide, log & hardware inventories, helpful hints, system explanation & recommended tool list within 1 week of ordering your package. You can become a Superior Logs “expert” before your logs arrive at site. 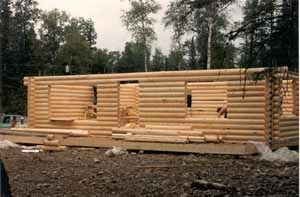 The 4-man framing crew assembled this 26′ X 36′ Juneau pre-cut 8″ Superior Logs package in 14 hours including drilling the 2 X 8 top plates for our 5/8″ all thread bolt system. Many times husbands & wives assemble their own log packages. Our Superior Logs are very dry (19% or less moisture content) which saves stacking time & shipping costs. 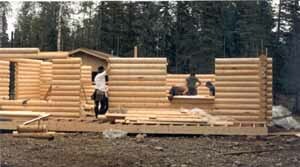 In the ’80s, we made pre-cut Superior Logs packages for Spenard Builders Supply (SBS), a very large Alaskan material supplier. The SBS store people erected 12′ X 16′ cabins over a weekend in front of their stores for display. 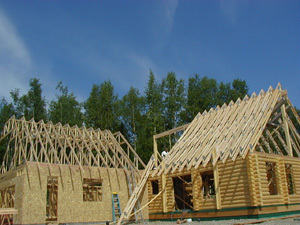 Superior Logs adapt to most any foundation, floor & roof systems. We usually stagger the top courses & extend the glue lam beam ridge to carry roof overhangs. The SBS people had lots of FUN!!! That’s the store manager on the rooftop. 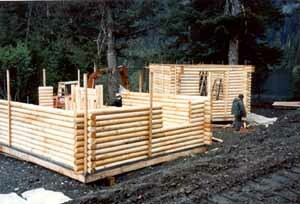 An Alaskan Native Village Corporation built these remote 6″ Superior Logs cabins. They use them for hunting & fishing at a remote Alaskan lake. We provided the complete weathered-in shell packages. 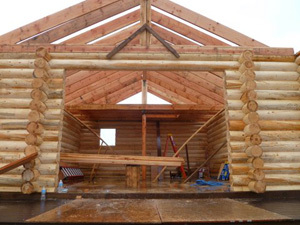 They assembled 6 cabins & the lodge using their own labor & our easy to follow instructions. 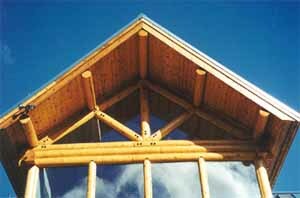 We provide accent logs if you want a log truss, roof purlin & ridge beam “log look”. These 10″ Superior Logs have 1″ slabs on top to nest against conventional roof systems. 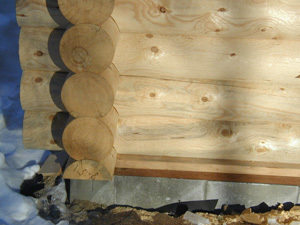 There is a glue lam beam ridge covered by our Superior Logs. 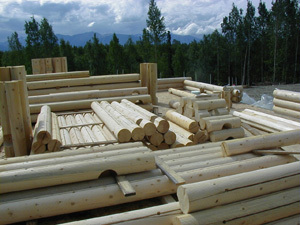 We supplied the truss gussets, bolts & raw logs. The builder created the trusses in the field. We DO NOT make log trusses. We only supply the materials.